With the baseball season being so long, a down year can really drag on a fan. On the plus side, playing that many games generates plenty of memorable moments, even in a forgettable season. Over the next few weeks, I’ll be taking a look back and sharing some of my favorite highlights from the 2018 season. Let’s kick things off today with a bit of a sensitive subject: Walk-offs. The 2018 Twins team will go down in infamy as the club that suffered 15 walk-off losses. That mark tied a team record, and fell just one shy of the MLB record. But it wasn’t all bad. 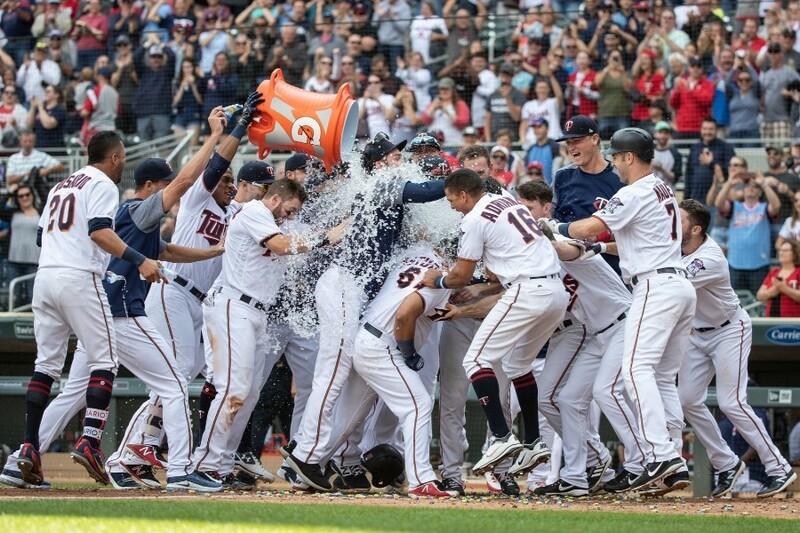 The Twins had six walk-off victories of their own, and each one tied in nicely with a major story line from the 2018 season. Ah April, when hope was still alive all across Twins Territory. Minnesota actually held a two-run lead heading into the ninth inning in this one, but closer Fernando Rodney blew the save, allowing Houston to tie it up. Houston managed to retire the first two Twins batters of the bottom of the ninth but Max Kepler, who had already gone deep early in the game, hit a rocket over the right field wall to end it. This victory gave the Twins a series win over the defending champion Astros. Again, hope was still alive and well. As for Max, this was one of many bright moments he had early in the season. Through April, Kepler was hitting .299/.358/.563 (.921), but he failed to keep that pace going, mirroring the team as a whole in some ways. To me, this was the high point of the entire season. Jose Berrios pitched seven shutout innings on his home island, but this game was scoreless through the first 13 innings. Cleveland finally scored in the top of the 14th, but a Miguel Sano home run tied it back up in the bottom of the inning. Things stayed knotted up until the bottom of the 16th, when the Sire of Fort Myers became the Hero of Puerto Rico. Ryan LaMarre was one of the feel-good stories of spring training. The 29-year-old minor league free agent broke camp with the Twins, but saw little playing time and was eventually sent to Rochester for a few games, then recalled to be the 26th man for this series. LaMarre came off the bench in the 10th inning of this game and ended up going 3-for-4 with the walk-off single to top Cleveland and put the Twins back on top of the AL Central standings. The Twins relinquished the lead over the weekend that followed and never recovered. What an incredible performance this was from Eddie Rosario, who was recently named Twins Daily’s Most Valuable Player for 2018. Rosie socked three home runs, the third of which finished things in walk-off fashion. His WPA on the game was a sky-high .547. To put that into perspective, WPA is designed so that the entire winning team’s roster will combined for .500 WPA. Rosario’s big day gave the Twins their third straight win over Cleveland, pulling them up from 6.5 games back to just 3.5. Eddie had a .317/.352/.573 (.926) batting line at the conclusion of this game, but (similar to Kepler) he eventually faded. Remember how the Twins climbed back in the race after Rosario’s three-homer day? Well, they followed that up with a stretch in which they went 9-18, dropping them all the way back to 12 games behind Cleveland. The Twins bounced back with a stretch of great play in which they won nine of their final 11 games heading into the break. This was the final game of that hot streak, and it was capped off with a walk-off grand slam from Dozier. It was a wild game to finish the first half. Dozier scored the go-ahead run on a balk he induced in the seventh inning, the Rays appeared to respond by intentionally throwing at Eduardo Escobar (and missing) and the benches cleared. The Twins were winning, showed they had plenty of fight left in them and pulled back form a dozen down to 7.5 back in the division. Poor time for the All-Star break to come. This ended up being Brian Dozier’s final home run with the Twins. The Twins failed to make up anymore ground once the second half got rolling, which set the front office into sell mode. Eduardo Escobar was already dealt and the Zach Duke and Lance Lynn trades were announced shortly before the start of this game. It appeared as though the Twins were conceding the division to Cleveland at that point. Somebody forgot to tell Mitch Garver. Plenty of Twins fans tuned out after the trade deadline, which is a shame because there were a few guys who took advantage of the opportunities created by all the roster shake ups. Willians Astudillo was a treasure. A unicorn in today’s baseball landscape, La Tortuga quickly became a fan favorite, and quickly proved he was much more than just a sideshow act. A veteran of eight minor league seasons coming into 2018, Astudillo had never hit more than four home runs in a single season. He found his power stroke in the Twins org, slugging 12 home runs in Rochester before adding three more with the Twins. This walk-off shot was his final round tripper of the season, but Willians would provide plenty more memorable moments through the rest of September. This walk-off win served as another turning point in the Twins’ season. They had won just three of their prior 14 games prior to this game, but went 14-7 to close out the year. That does it for the walk-off highlights, which was your favorite? Eddie Rosario's 3 Hr day, capping it with the walk-off was the highlight for me.Optimism for the season was still there, and I almost felt that Rosario could be the hero to carry the team to catching Cleveland.But alas, heroes grow fatigued when they're pretty much the only ones doing the heavy lifting, and Eddie too wore down and limped into the off season. They were all joyous and a good reminder of how much fun a baseball season really is - even a season as miserable as 2018 for the Twins. My favorite was Dozier's, closely followed by Astudillo. Does anyone else think that all this celebrating a "walk off" win is more than a bit over the top? Hey, if the game is meaningful and you have moved into first place or clinched a pennant, then by all means go out and celebrate. But nowadays (I can't remember exactly when this trend to celebrate game-ending hits started, but I don't recall seeing such celebrations a few decades ago) it strikes me as almost childish (then again, we never did that sort of stuff in Little League!) when a last place team celebrates a walk-off win. That said, I think it's good for players to show emotion and pump their fists after knocking in a game-winning run. But to have the whole team jump up and down like kids, throwing water on the runner who scored ... well, it strikes me as just too silly. I hope we have more to talk about then these isolated games and a terrible season. I wish I could celebrate him, but it really does not help to put this season behind us where it belongs.